Taking the traditional conference phone out of the boardroom. Connecting and collaborating with a vast range of Communication devices, all Desk Phones, PC and Mobile. The Konftel 55 is an easy-to-use, compact conference unit with impressive, crystal-clear sound thanks to the patented audio technology OmniSound® HD. The Konftel 55 has been specially designed to be the hub of your communications and connects computers, mobile phones/tablets and desktop phones. Whatever the communication tools, your meetings will be conducted with superior sound quality. Moreover, VoIP calls can be bridged with calls via a desktop or mobile phone. Combine and switch connections easily on the LCD colour screen's smart user interface that only displays the current connections. Make a call and the meeting is under way! 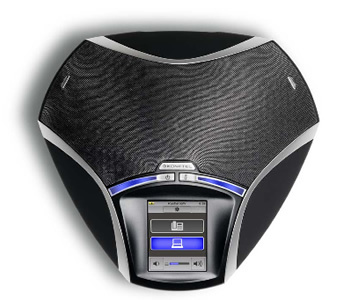 The Konftel 55 lets you record calls or dictations and you can move the memory card to your computer to save or share the audio files. The Konftel 55 is highly portable and looks just as good on the desktop and in the home office as in the conference room. Upgrade your Konftel 55 with the latest software (version 2.0.6 or better) and get enhanced support of functions for Microsoft Lync.